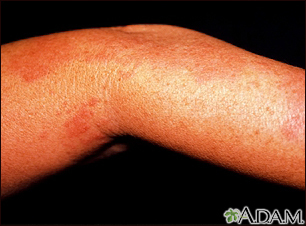 This is a picture of herpes zoster (shingles) on the arm. Shingles are caused by the same virus that causes chickenpox. Outbreaks of shingles follow the distribution of nerves in the skin. This distribution pattern, seen here on the arm, follows a dermatome. This is a picture of herpes zoster (shingles) on the hand and fingers. Shingles are caused by the same virus that causes chickenpox. Outbreaks of shingles often follow the distribution of nerves in the skin. This distribution pattern is called a dermatome. 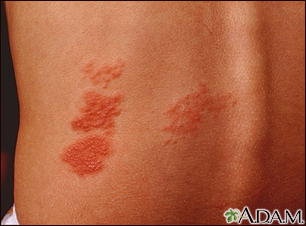 This photograph shows clusters of blisters (vesicles) and redness (erythema) caused by herpes zoster (shingles). The pattern follows a dermatome. The area may burn or sting before the appearance of these vesicles. Early treatment with an antiviral drug (within 24 hours of the appearance of the vesicles) may prevent progression or reduce the time the infection is active (duration). Reviewed By: David Zieve, MD, MHA, Medical Director, Brenda Conaway, Editorial Director, and the A.D.A.M. Editorial team. Editorial update 10/30/2018.